My phone buzzes just as I’m hopping on my bike, telling me I’ve got a photo in my whatsapp. M has sent me a photo of two different earrings, set side-by-side with a series of questions marks. I know where she’s coming from. Buying a flamenco dress every two years and figuring out how to deck it out has become my adult version of dress-up (who needs Halloween when you can wear ruffles? And big flowers on your head! And side-eye anyone wearing an outdated dress design!). 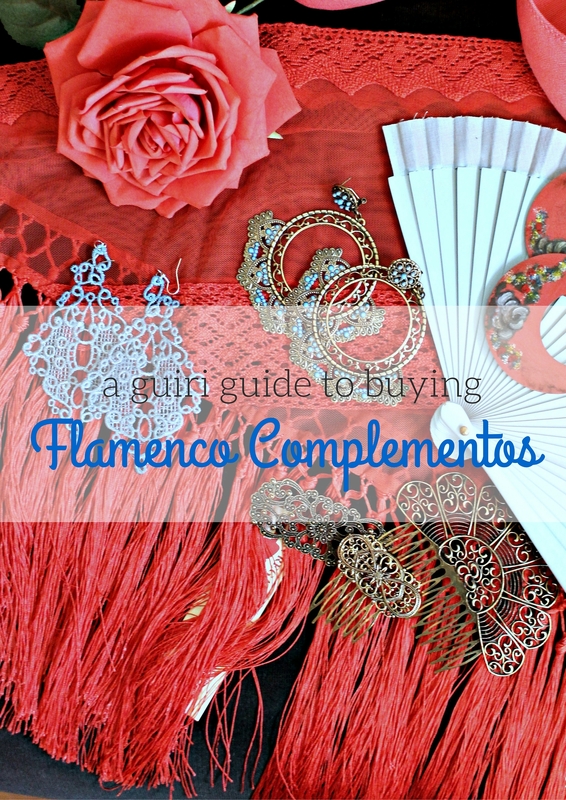 I’m probably just as excited to shop for complements than I am for the actual flamenco dress. I confess that my first Feria was rife with mistakes: I wore jeans and a ratty tee to the alumbrado, bought baby-sized accessories and – gasp! – wore my mantoncillo around my hips because I didn’t know you had to buy a brooch for it. Hey, no one helped me, and the lady in the Don Regalón probably laughed when I chose demure earrings that only an infant should have been wearing. Shame is having a six-month-old show you up on Calle Bombita while she’s napping in her stroller, trust me. Oh, and did I mention I also wore a purse and a WINDRBREAKER?! Guiri, no. 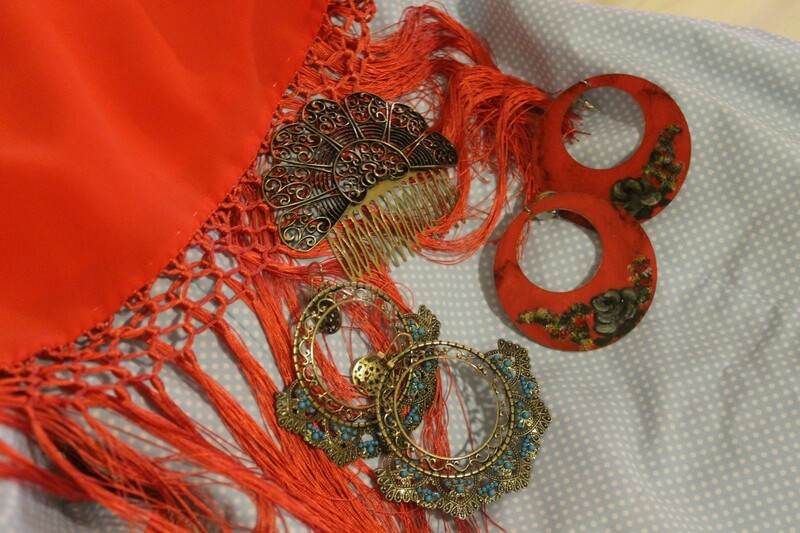 I sent M the cardinal rule of flamenco accessories – BE BOLD. When else can you wear ridiculously oversized jewelry? When else is risk-taking so handsomely rewarded? Her dress is black, so the obvious, traditional choice is red. When I suggested gold, fuschia or even neons, I think I confused her even more. Having options makes sticking to a color palate really, really tough. Let it be known that I am quitting my job for the next month to become a flamenco accessory consultant. First, you have to know the basics. Two months before the Greatest Week Ever begins, flamenco dress and accessories stores begin to pop up in the center of town, and you’ll hear the word traje spoken with a word density that makes your head spin (that, and azahar, playa, pasos and vacaciones, four sacred words in the sevillano lexicon when spring arrives). Look for the stores near Calle Francos, Calle Cuna and Calle Asunción for both dresses and accessories. Your shoes can be bought on Calle Córdoba or any Pasarela store around town. If you’re looking for a deal on a dress, trajes are sold at warehouse prices in the towns outside of Seville, as well as older models at El Jueves flea market. A dizzying variety of complementos can be found at El Corte Inglés, Don Regalón and a number of specialty shops. Neighborhood accessories stores also sell bargain items in plastic and sometimes beads. Rule of thumb when it comes to your accessories: the bigger, the better. I mean it. No color, shape or size is off-limits. 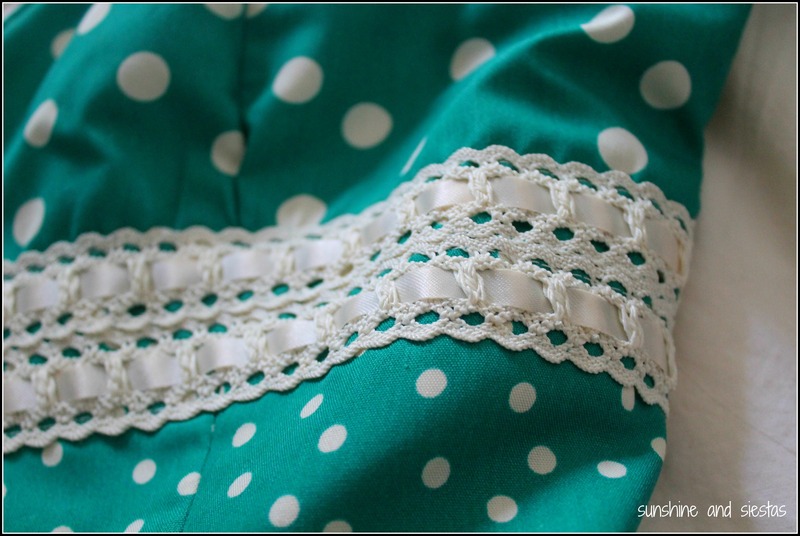 My new traje de gitana is a greenish turquoise color with cream-colored lunares, complimented by cream-colored encaje under the bust, where the sleeves open at the elbow, and at the ruffles. Since I didn’t pay for the dress, I was willing to splurge on complementos this year. My advice is to browse before you buy. Because there are endless combinations of colors and styles, it’s easy to lose your head. When you have a dress made for you, ask for a swatch of fabric to take to the accessories stores for matching colors. I beelined straight for Isabel Mediavilla, a local designer who is friendly and helpful when it comes to suggesting possibilities. When she and I had come up with a color palate – dusty purple and gold – it was time to get to work. I always buy the shawl as soon as I’ve got the dress nailed down. 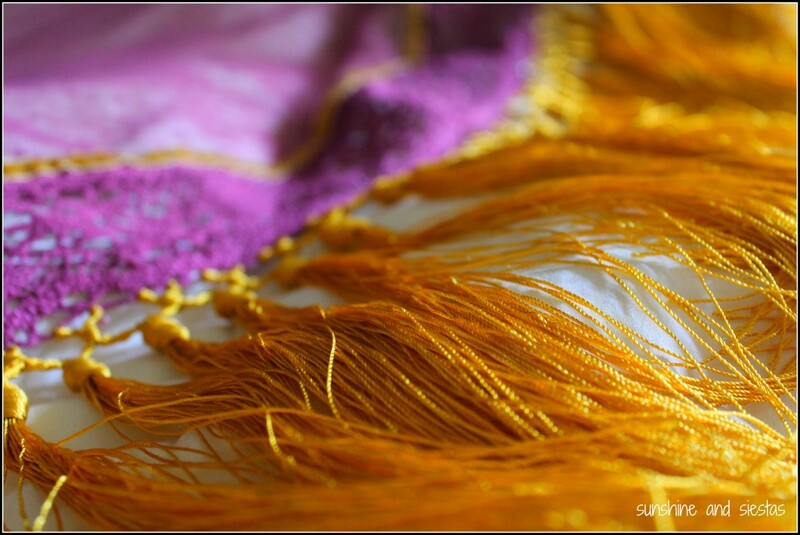 These shawls can cost up to 100€ or even more, given that some are hand-painted, hand-embroidered, a mix of patterns and textures. Buying the shawl will help you have an idea of what accessories will pair best. 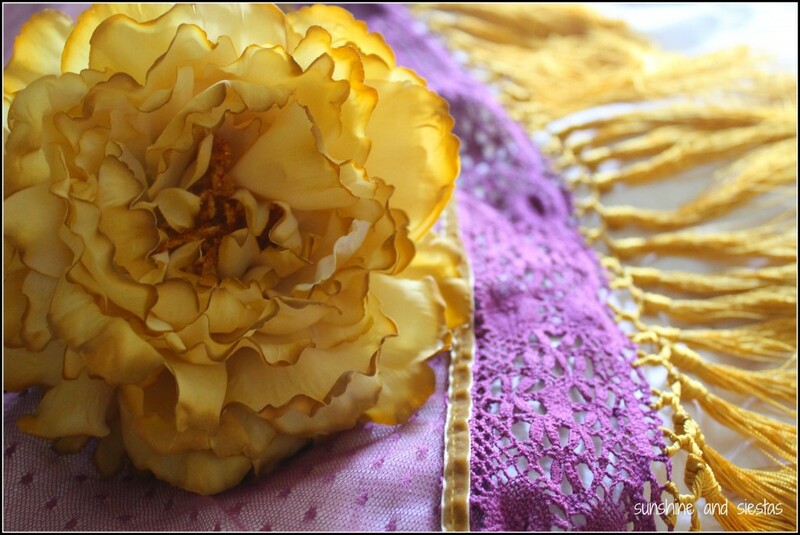 Some women choose a gargantilla (a choker with flecos, or the long fringe that hangs down) or simple flecos that are sewn to the neckline of the traje de gitana. The flower is a gitana’s hallmark, meant to look like a rose or carnation and worn either on top of the head or tucked behind the ear. The flowers are made of cloth and have a flexible “stem” with which to secure it to your head with bobby pins. Flowers can be big or small, but you should probably just go ahead and get a big one if you’ve got “la altura” according to the snotty lady at the Corte Inglés. Flowers trends change every year, so this is a good place to browse before commiting. I went back to Isabel Mediavilla, as she has literally a wall full of flowers of every imaginable color and style. I’m going big this year – BIG. In one of my less memorable Feria moments, I let a cheap pair of earrings I’d bought at Don Regalón get the better of me – I pouted when one slipped out of my ears while dancing (hey, the 13€ they cost meant an entire hour’s private lesson!). I love the bold, intricate earrings that women wear during the fair and am constantly looking for ones that aren’t too heavy. I bought these ceramic beauties, but they’re a bit heavy, and my earlobes may not be able to handle them! 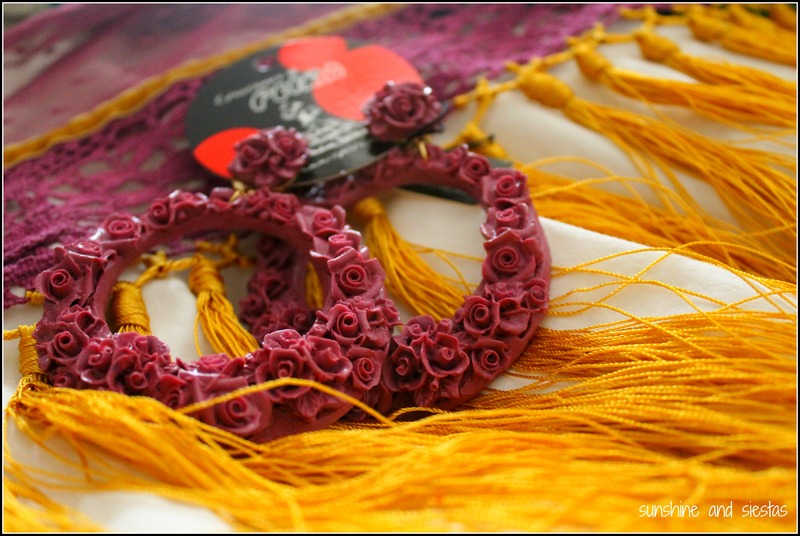 Many times, you’ll find brooches that match with your earrings, particularly at the Corte Inglés. 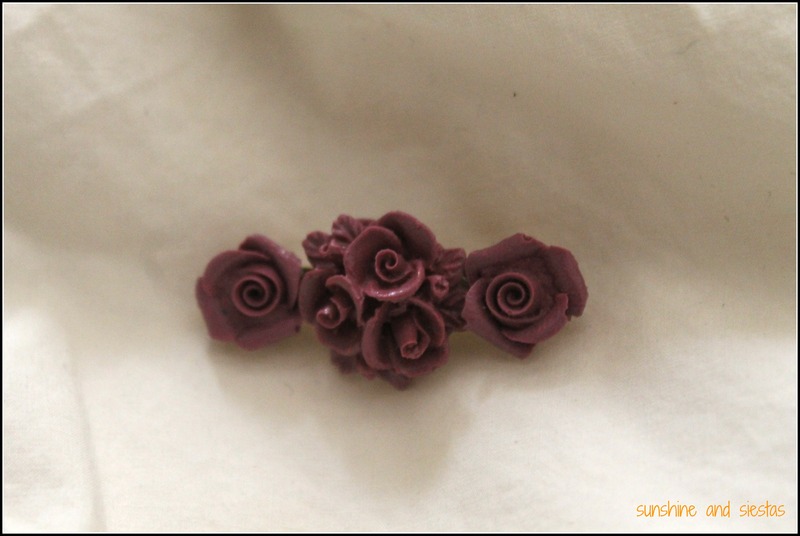 A broche is mega important if you’re wearing a mantoncillo, as this will attach the shawl to your dress and making dancing, eating and drinking hands-free. Just, please, don’t tie the ends of the shawl together. Spend a few bucks on a brooch and you’ll not regret it! 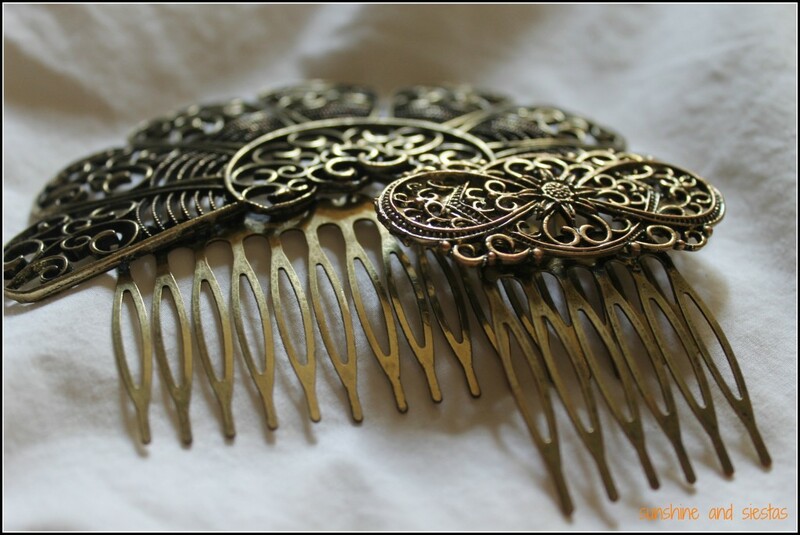 Even in the age of bobby pins and hairspray, many women choose to add plastic or metal combs to their hair. They often don’t serve any sort of purpose, but women wear them just behind the flower or to capture the whips of hair that aren’t shellacked to their skull. When matching your combs, try and be consistent with your other accessories. If you’ve got plastic earrings, stick with a plastic peineta. Same goes for metal and for colors. Although I’d argue that shoes are the least of your aesthetic worries during the fair (they’re covered by your ruffles! ), it’s important that you wear something comfortable for all of those hours on your feet. Women opt for espadrille wedges or even cloth flamenco shoes that have a thick heel for support. Calle Córdoba, near Plaza del Salvador, is a narrow alleyway full of zapaterías, so make that your first stop. Let me just say this – if you’re wearing stilettos, you’ll be doing very little dancing and probably a lot of pouting! 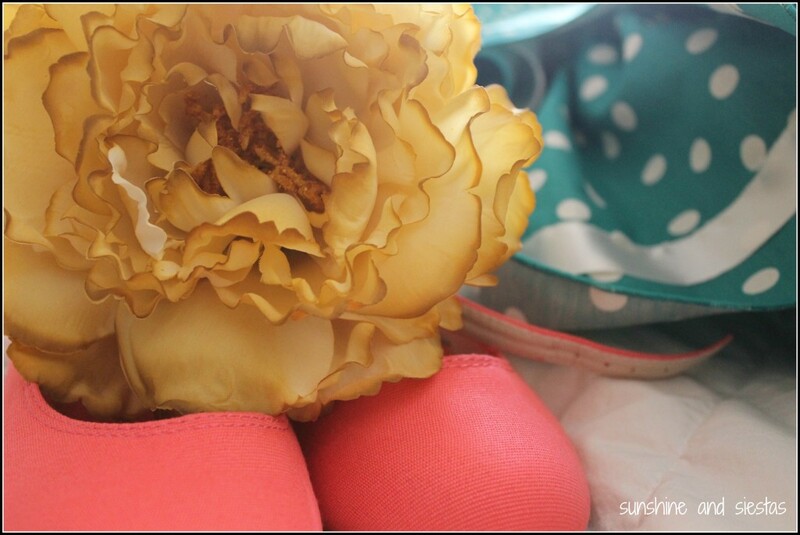 You’ll also need to buy hairspray and bobby pins to secure the flower’s stem and the combs without a doubt. I’ve also got a donut for making a big, thick bun, as well as a fan because this year’s fair goes well into May. Some women opt for necklaces, bangles, mantoncillo or no – what it all comes down to is feeling comfortable and wearing your accessories confidently. Remember that the flamenco dress itself is heavy and it can get hot under there! And no need to wear a purse, as most flamenco dresses have a zippered pocket hidden in the ruffles of the dress. I take the necessities – cash, house keys, my phone and extra bobby pins, safety pins and lipstick. As for M? I sincrerely hope she went with hot pink. Lo dicho: go big or stay at home! Want to read more on the Feria de Sevilla? Oh how I wish I were dressing up for Feria this year! Think I can get away with throwing my own Feria in Sydney? They probably don’t offer the nicest of trajes here Anyway, I’m drooling over your photos and can’t wait to see your full outfit together! Because I read this just before bed, I had a dream in which I went complementos shopping and found myself wandering into an ancient, candlelit traje shop, three stories below ground, with warped, creaky wood and a spooky old owner. Not the best lighting to choose the colors of a traje, but now I want to visit that shop in real life! It sounds amazing, and I may make it my life’s work to find it. I can’t relate to this…at all…being a guy based in Galicia :D…but this was a really cool, informative peek into this very unique culture that Andalucía has. 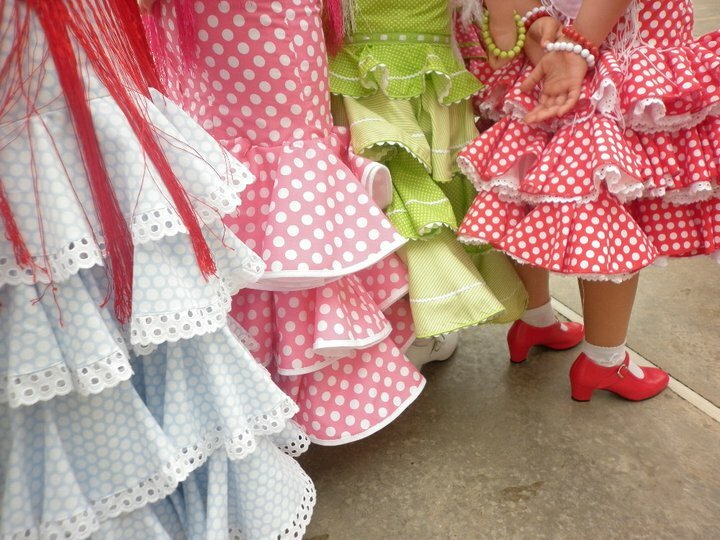 Have fun at the Feria de Abril/de Mayo this year! Beautiful! I love the earrings. So much fun! When we were in Seville I was drooling over all the gorgeous dresses. Can’t wait to see the finished product! It’s so hard not to get carried away! Just 31 days until the Alumbrado! At this point I’m just way too excited by all your pictures and I just want to see the dress already. 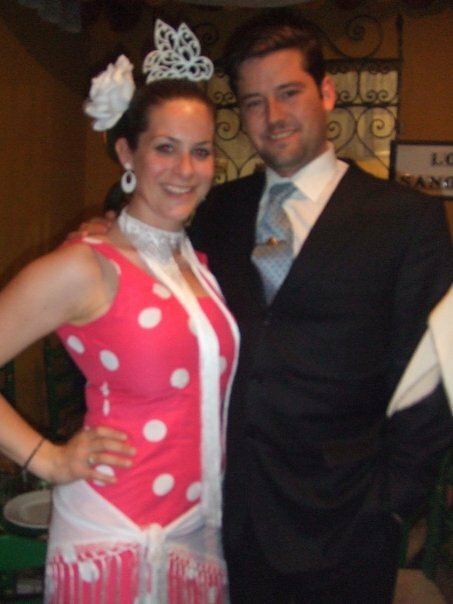 I don’t know if I would enjoy feria (it does look like fun) but it would be an excuse to wear a flamenco dress, but I’ve never really had the opportunity. Also great write-up of all the steps one must go through if one wants to follow all the sartorial rules at feria! You’ll get the real thing soon enough! I just tried everything on again today! I’m so excited to see. Thanks for this, Cat!! I haven’t even started thinking about complementos. Time to get it together and this is going to help me a ton! Does anybody ever gatecrash tradition, Cat? Do you have locals subverting the dress sense? Guys dressing as gals and vice versa? Or is that only something done during Carnaval? There was HUGE controversy a few years ago when a homosexual couple was photographed dancing sevillanas and it made the paper. Sevillanos are tell traditional, after all! What a nice tradition! I love the colors and the patterns of those dresses, I’ve been to Spain few times but I’ve never visited Andalucía but I’d love to! OMG this puts dirndl shopping to shame. So intimidating, yet freaking awesome! Alex @ ifs ands & butts recently posted..things every expat should know before moving abroad. My cousin’s reaction to buying a dirndl: “We have 20 minutes before the store closes. Um, this one looks ok. Hope it fits! Here’s my credit card.” Buying a flamenco dress is a lot more difficult! Wow – this is making me long for the feria! I was lucky enough to be invited into a private caseta by my (now) novio sevillano last year for my first feria, it was one of the most memorable experiences of my life. I can’t wait to go back next year! Have a great time! I’m ridiculously jealous.